Choose childrens birthday party themes for a fun birthday party. These ideas for kids birthday parties allow you to create a fun themed birthday party. If you are planning a birthday party for kids, it is easier if you have a theme, especially for school age kids. For younger kids, a theme is less important to the child and only matters if the parent cares. Regardless, a theme for the party makes it easier to choose invitations, pick a party location, select a kids birthday cake, choose party decorations & favors, and plan activities or party games. 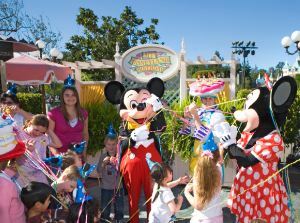 Birthday Parties for Kids at Home or Away? I think one of the first decisions to make is whether to have the birthday party at home, or outside the home. Parties at home can be less expensive if you have the space to host the party. You also get more time to spend together, and more privacy. If you decide to have a birthday party outside the home, I recommend you have the other parents bring or drop off their children to the location where the party will be held. I made the mistake one year of having all the kids come to my house, and one was an hour late so by the time we got to the ice skating rink we only had 15 minutes left in the party room! Also consider the ages of the children in planning your party, and whether parents are invited too. Preschoolers and younger will usually mean the parents will want to stay, and you will want them there too! Older kids will usually just be dropped off, so if you are inviting 20 2nd grade boys to a party, you will probably get 15 or more boys who end up coming, and no parents! Here are some popular childrens birthday party themes. You will find many decorations, party favors, and birthday party games centered around these themes. Here are some teen birthday party ideas. Be sure to involve your teen in planning the party, or their friends if it is a surprise "kidnap" party. For more ideas, see our page on teen birthday parties.